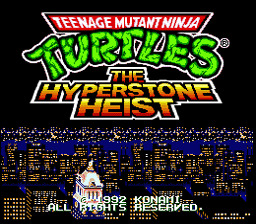 Play Teenage Mutant Ninja Turtles: The Hyperstone Heist Now! watching their favorite news reporter--April O'Neil--on television. Things are pretty comfortable for these boys in their well-furnished subterranean hideout. That is, well-furnished if you're a turtle. A mutant turtle. Teenaged, no less. And a ninja. Okay, so you and I may not be comfortable, but these guys think the place is, like, mondo to the max. April is reporting a story from nearby Ellis Island. notice, but the television viewers do. "Whoa dudes! Did you see that?" man." Mike answers. "But there was a most spectacular flash. It looked like an expl..." Mikey stops talking. His mouth hangs open as he stares at the screen. His eyes growing wider. Leonardo rubs his eyes. "Am I seeing things, or is April growing?" "Your perception is growing, my son." Comments Splinter. The large humanoid rat--who also serves as a teacher and mentor to the boys--is standing in the doorway at the back of the room, watching the events unfold on TV. "If you will observe, the city is actually shrinking." voice booms out from the speaker. "I have in my possession the treasure of Dimension X. It will allow me to take control of New York City today, and soon, the entire world. In my hand is the Hyperstone. I know you're watching, Turtles. You've gotten lucky in the past, but you won't stop me this time! Ha ha ha!" The screen fades to black. on the shoulder. "You're a turtle dude. You don't wear shorts." Based on the hit TV show this game has always been a favorite of mine. Shredder has taken a Hyperstone from Dimension X that allows him to shrink huge objects into much smaller ones. He plans on ruling the world this way and decides to start in New York. Now the turtles have to save the day once again! Go through each level defeating more and more of the Foot Clan as you work your way to the boss of each level. Use your moves and many skills to eliminate all possible to get a free man. Run through levels if your in a hurry to get to Shredder!